Wow. It’s been ages since I posted, thanks to someone stealing my handbag with my camera in. So I was delighted when when Tami announced a new Food Network Friday because it was just the inspiration I needed to start blogging again. If you haven’t been following, we pick a recipe from Food Network and veganise it. This time it was a BBQ pork panini from chefs I don’t know, The Neelys. Maybe they’ll come to our version of Food Network soon? I’m getting fed up of the same few programmes all the time. I thought for quite a long time about how to create the pork. I was planning to use a sort of tempeh bacon, but then I remembered that I’d wanted to try some seitan in my food smoker for ages, so I decided to go down that route instead. I made some seitan, using the recipe for red seitan which will be in the brilliant forthcoming book Viva Vegan. Then I smoked it using hickory for about 25 minutes. I sliced it up and then used vegan versions of cheese and butter and proceeded with the recipe as written. 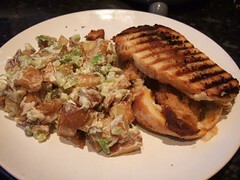 As previously, I used this as a way of trying another recipe by The Neelys, so to serve with the panini I veganised this recipe for fried potato salad. It was very easy to do by using vegan mayonaise – and I used green onion instead of red as that’s what I had. I should take this opportunity to warn people that dijon mustard in England seems to be a lot hotter than it is in America. I found this out when recipe testing but forgot when I made the salad so the mustard dominated a bit. The pork sandwich was a triumph. 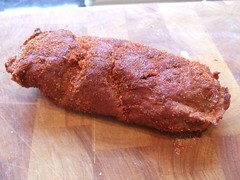 Smoking the seitan worked beautifully and the rub gave it a nice crispy edge. I’d definitely make seitan that way again. The salad was good – I never met a potato salad I didn’t like, but I think you could get the same effect by oven roasting the potatoes and use a lot less oil. Thanks for hosting Food Network Friday Tami. It’s such a fun way to try new foods and think about flavour combinations! Oh Liz! That smoking method sounds awesome. I have a huge smoker outside from our meat eating days. I think we need to fire it up and try your genius idea! I can’t belive this article appeared in Google News! Great work! Google likes your writing!